The RP Photonics Buyer's Guide contains 13 suppliers for scanning lenses. For a variety of laser applications such as laser marking, drilling, laser displays, optical coherence tomography (OCT) and scanning laser microscopy, it is necessary to scan the direction of a laser beam and focus it to some plane (or for 1D scanning along a line). This is often achieved by using some kind of rotating mirror or galvanometer mirror in conjunction with a scanning lens. As shown in Figure 1, such a lens will at the same time focus the beam and modify its propagation direction. When using a simple spherical lens for that purpose, the focus positions can actually not all be in the wanted plane, but rather lie on an approximately spherical surface. Therefore, the spot size on the target plane will be increased in the outer regions. To solve that problem, flat-field scanning lenses have been developed, which provide an approximately constant spot size throughout the target plane. Precisely speaking, these are usually not simple lenses, but rather multi-element lens systems, having a substantial total length. Figure 1: Scanning a laser beam with a rotating mirror and a lens. Only if the lens is a flat-field scanning lens, the focus is always on the target plane. The spot on the target plane can become somewhat elliptical, particularly if the beam angle after the scanning lens is substantial. Therefore, one usually needs to limit that angle. For an ordinary flat-field scanning lens, one obtains a nonlinear dependence of the spot position on the angular position of the rotating mirror. That nonlinearity can have various consequences. For example, a displayed or acquired image may be distorted, or the processing speed varies with the position. Therefore, so-called f–theta lenses (actually lens systems) have been developed where the spot position depends linearly (with only weak aberrations) on the beam angle θ: it is approximately the product of the focal length f and the beam angle θ. f–theta lenses are quite common for applications like laser marking and laser displays. Because an exactly linear scanning is not possible, suppliers may specify the field distortion (f–theta distortion) is a function of deflection angle as a percentage. For good designs, the distortions can be far below 1%. In some cases, the mentioned nonlinear distortions of scanning lenses can also be compensated with software, so that an f–theta lens is not required. For some applications like laser drilling of holes, a remaining problem is that the laser beam hits the target plane with non-normal incidence, except in the central point. Therefore, there are also so-called telecentric scan lenses, which are designed such that one obtains normal incidence for all points of the target plane (see Figure 2). 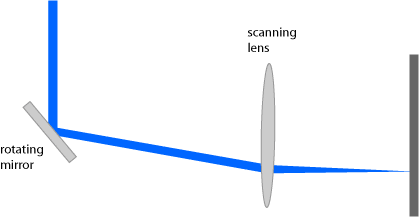 Figure 2: Scanning a laser beam with a telecentric lens (which in reality is usually a multi-lens system). The beam has normal incidence to the target plane for any target points. Telecentric lens systems are not only requiring more complicated designs (e.g. with more elements), but also have the obvious limitations that the scanned area on the target plane is limited by the size of the lens. That usually makes them unsuitable for display purposes, for example. An advantage, however, is that one obtains a quite precisely constant spot size or the full area. The most important parameters of a non-telecentric scanning lens are the focal length and the output scan angle, which together determine the scan field diameter. The focal length together with the input beam radius (assuming that there is a collimated beam determine the beam radius in the target plane: the larger the input beam, the smaller is the spot size. The distances from the focus plane to the output side of the lens housing is called the back working distance. It is often good to have a substantial back working distance, e.g. to avoid contaminations of the lens. It may also be useful to place a protective optical window close to the lens output. For telecentric lenses, the maximum range of beam offset is important; it limits the scanned area in the target plane. Like other lenses, scanning lenses are often designed for a certain range of operation wavelengths, which may be limited by the properties of used anti-reflection coatings and/or by chromatic aberrations. However, there are also multispectral lenses which work well e.g. at two different wavelengths (e.g. 1064 nm and 355 nm, corresponding to the third harmonic), exhibiting approximately the same focal length for both wavelengths. (This is relevant for multi-photon fluorescence microscopy, for example.) Other devices are color-corrected, also called achromatic, e.g. for use with broadband ultrashort pulses. For applications in laser material processing, the damage threshold of the lens system may be of interest. It is normally specified as an optical fluence in units of J/cm2. Some scanning lenses need to be operated with very high optical powers. It is then important to have low parasitic losses and suitable optical materials in order to avoid thermal effects, which might affect the beam shape and the focal length. F-Theta scanning lenses designed for laser marking applications with Nd:YAG laser’s fundamental (1064 nm), second (532 nm), or third (355 nm) harmonic.